How Many Hurricanes Must It Take? I developed this theme further for a Perspectives article in Science, “A global strategy for protecting vulnerable coastal populations,” which was published in September 2014. In 2015, on the tenth anniversary of the US Gulf Coast disasters, I was asked by Nature to reflect on “Hurricane Katrina’s lessons for the world.” Once again, I called for coastal protection plans, similar to the Louisiana Coastal Master Plan, for the world’s most vulnerable people. The recent devastation wrought by Hurricanes Harvey, Irma, and Maria across the Caribbean, Puerto Rico, Florida, and Texas are yet another sober reminder that it is the poorest nations, regions and populations that are the most vulnerable to coastal disasters, and which need assistance in terms of immediate emergency response as well as long-term recovery efforts. In the aftermath of an emergency, saving lives and providing relief to survivors is of paramount importance. Such a response depends on supplying the “Three Ts”: telecommunications, transport and tonnage. The failure to deliver an adequate response was evident in the post-disaster problems encountered in the Caribbean. Even the United States, with its vast federal resources for emergency relief, could not mobilize assistance quickly and sufficiently for Puerto Rico and the U.S. Virgin Islands after Hurricane Maria. International relief efforts helped, but also faced logistical difficulties that depended on donations and charities—much of which were raised only after the disaster struck. Sadly, such outcomes are likely to occur again and again across the world. Many island countries and low-lying coastal areas—especially where the vulnerable poor reside—are ill-prepared for the scale and intensity of damages from the direct hit of for hurricanes or other coastal disasters. This does not have to be the case. In my 2014 Science article, I outlined what a two-tier global strategy for protecting vulnerable coastal populations could look like. The strategy is summarized in the figure below. The additional investment required is not expensive. For example, a global emergency task force that is well-equipped and capable of restoring telecommunications and transport and coordinating international and domestic relief support would need approximately $2 billion in initial funding and around $400 million in annual operating costs. 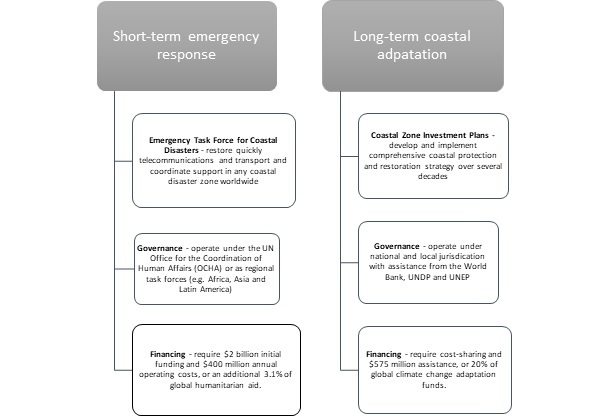 An additional $600 million would finance a program to support long-term global adaptation in vulnerable coastal zones, which could also assist the development of coastal management and adaptation plans for many regions of the developing world. Governments do not need to do this on their own. The global insurance and reinsurance industry also has a vested interest in coastal investment and protection plans. Industry insured losses for Hurricane Maria in the Caribbean will be between $40 billion and $85 billion, with Puerto Rico accounting for more than 85% of the damages. A study commissioned by Lloyds estimates that insurers have paid out over $200 billion in claims for damages due to coastal floods in the past 10 years. These losses could be dramatically reduced if the insurance industry invested in conservation of wetlands, such as mangroves and marsh, which provide natural protection against these risks. For example, as the study for Lloyds cites, marsh wetlands in the northeast United States saved more than $625 million in flood damages from Hurricane Sandy in 2012. As global flood losses are expected to rise from $6 billion annually in 2005 to an estimated $52 billion in 2050, the insurance industry has an incentive to finance coastal habitat conservation, which can be up to 30 times cheaper than investing in seawalls and other physical flood control infrastructure. So, I ask the question again: How many more hurricanes must it take before the international community, including industries that have much to gain or lose from natural disasters, develop a global strategy for protecting vulnerable coastal populations?